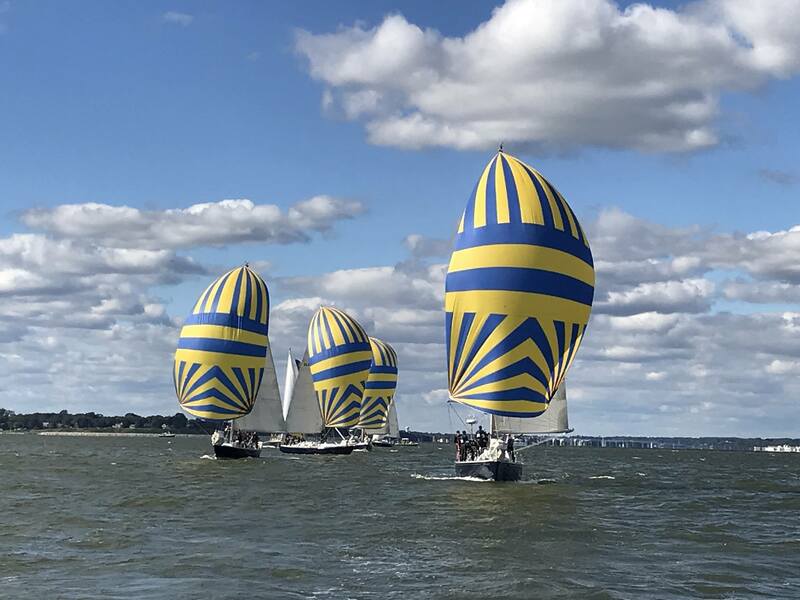 Hurricane Michael’s remnants brought some excitement to the 2018 Star Worlds, Great Chesapeake Bay Schooner Race, and the Round the Lights Race among others. Winners included a Brazilian team, competitors from the Chester River, two teams from New York, and a couple from Hampton. Here’s your SpinSheet racing roundup for the weekend of October 12-14. On Saturday, October 13, when the 62 teams arrived for the final day of the Star Worlds at the Tred Avon Yacht Club with two races scheduled, and a very windy forecast, anything was possible. Brazilian team Jorge Zarif and crew Guilherme de Almeida had a comfortable eight-point lead over the second place team Paul Cayard (USA) and Arthur Lopes (BRA), and even more over the third place class president Hubert Merkelbach and Markus Koy (GER). After a DNF in Race 5 for Cayard / Lopes, and a discarded DSQ for 2017 World Champions Eivind Melleby (NOR) and Joshua Revkin (USA), the window of opportunity opened back up for either of the three teams to take the Championship title at the start of a thrilling Race 6. Zarif and de Almeida fought a tough battle, always sailing within top 10 boats, losing some points in the second upwind beat, then regaining them in the last downwind to finish fourth behind race winner Tomas Hornos and Pedro Trouche, just meters before Melleby / Revkin, Eric Doyle and Payson Infelise in third. The Brazilians narrowly clinched the fourth spot from George Szabo (USA) and Roger Cheer (CAN) by half boat length. Olympic Finn sailor Jorge Zarif at 26 years old is the youngest World Champion since 1981 when Alex Hagen (GER) won as a skipper at the same age. “I feel really happy! The Star is such a traditional Class full of good people and good sailors. It feels really good to have the opportunity to put my name on that trophy,” said Zarif. Eivind Melleby and Joshua Revkin had a fantastic week that started with two wins in the first day, and they are among the best Star sailors of all time wining in 2017 in Denmark and as runner up this year. Paul Cayard sailed in his first Star World Championship 40 years ago as a crew in his hometown, San Francisco. He won the prestigious trophy back in 1988 in Buenos Aires, and since then he has engaged in many more adventures, winning some of the most epic challenges of our sport. Now he is back competing in the Star class with his Brazilian crew Arthur Lopes. The week was not easy, with the weather being greatly affected by Hurricane Michael, but in the end competitors had an epic last day. EDITOR's NOTE: Event chair Andrew Parish, the Tred Avon YC, sponsors, and the army of volunteers that made this event possible should be very proud of their accomplishments. During my limited time at the casual crab feast Thursday, I heard nothing but praise from competitors from around the globe for the top-notch hospitality of the club and all involved. It was touching to watch locals teach international competitors how to crack crabs Chesapeake-style. From the stunning daily awards--custom pen and ink and watercolor creations by Marc Castelli and half models by Tom Price---and the love of the Star Class boats and heritage, to the clever decor of Campbell's Boatyard and the terrific press by Laura Beigel and video work of Ashley Love and Bruce Nairn at T2P.TV, this event was spectacular. Congratulations! Find complete 2018 Star Worlds results here. Find SpinSheet’s Saturday Star Worlds photos by Will Keyworth here. Find SpinSheet’s Thursday night crab feast party photos by Molly Winans here. 2019 Star World Championship will be held in Porto Cervo, Italy, hosted by the Yacht Club Costa Smeralda from June 13 to 23. A blustery and fast Great Chesapeake Bay Schooner Race took place Friday, October 12 (instead of the usual Thursday start, thanks to the remnants of Hurricane Michael) into Saturday, October 13. After a few days of festivities in Baltimore, including open boats, activities with school children, and the popular Parade of Sail, the actual race began off Annapolis at 11 a.m. and ran 120 miles to Portsmouth, VA.
Find full 2018 GCBSR results here. Ten sailing teams gathered at the U.S. 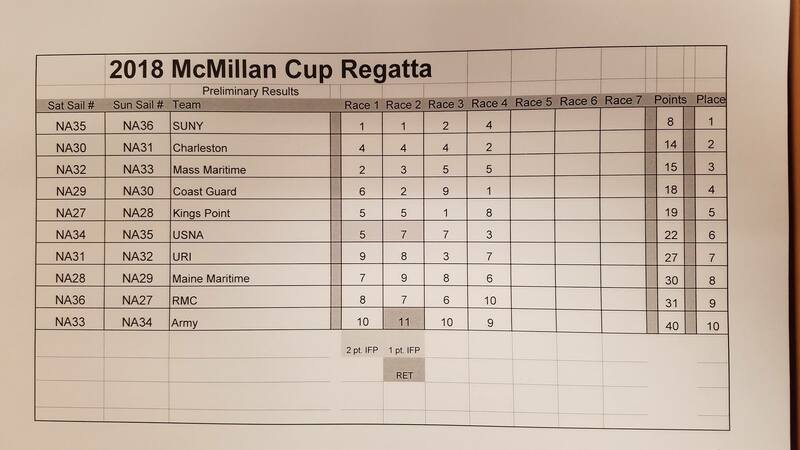 Naval Academy to contest the McMillan Cup, the oldest collegiate sailing event, October 13-14. Due to light air on Sunday, Saturday’s results stand as the final ones. Congratulations to the SUNY team! Severn Sailing Association hosted its Lightning Frigid Digit regatta over the weekend. Yet another New York team proved victorious. Find SSA results here. From Lin McCarthy’s Southern Bay Racing News You Can Use: The 2018 RTL had a special twist to racers this year. Participants in this event always pay special attention to current over the course at a given time. This year, some sagely skippers posited that Mother Nature threw them a curve in the form of the impact of Hurricane Michael on current tables. The timing seemed off, and it was certainly running strong. So, adverse current was a significant factor in the final standings. Danger Paws (Neil Ford), stayed well inside Hampton Bar to avoid the adverse flow while heading toward the harbor exit and proved the theory by winning the race overall. Christian Schaumloffel, Mirage, used the same tactic and finished 3rd overall. Forty (40) skippers and crew raced Saturday in 10-20 knots from the North. While a solid majority chose to round Thimble Shoal Light first, finish times were tight and only two minutes separated boats that turned left first from boats that turned right first toward Middle Ground Light . PHRF A (9 boats): 1.Neil Ford, Danger Paws; 2.Christian Schaumloffel, Myrage; 3.Will Roberts, Remedy. PHRF B (9 boats): 1.Rusty Burshell, Cool Change; 2.David Taylor, Wham Bam; 3.Bob Archer, Bad Habit. PHRF C (8 boats): 1.Alan Bomar, Roundabout; 2.Ben Cuker, Callinectes; 3.Jeff Rogers, Halaha. 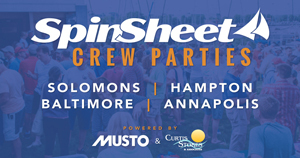 PHRF Non-Spin – 2 headsails (4 boats): 1.Robert Duncan, Oh Sheet; 2.Al Johnson, Seeker; 3.Jay Thompson, Restless. PHRF Non-Spin – 1 headsail (4 boats): 1.Bill Ripley, Obsession; 2.Bob Howell, Pegasus; 3.Cliff Porter, Tilt. CRUISING (6 boats): 1.Ken Utley, Mortar Offer; 2.Tim Etherington, Wine Down; 3.Dan Fox, Rare Vos. Old Point Comfort Yacht Club was organizing authority for this race. Event Chairman: Tim Etherington. Also from Southern Bay Racing News You Can Use: Fishing Bay Yacht Club hosted this event. Event Chairman, Jon Deutsch reported that, “Fifty-one (51) Lasers were in Deltaville at Fishing Bay Yacht Club for the regatta this past weekend. Thursday night the remnants of Hurricane Michael roared through eastern Virginia knocking boats down in the dry sail area and leaving the club without power until Sunday morning. . . . . generators were wired into the critical systems to inflate marks, lower boat lifts, refrigerate food, run the kitchen and light the bathrooms. The sailors were undeterred by the lack of lights, cold showers, no running water in [host] residences. . . . FBYC volunteers made it a great weekend, putting their personal storm recovery needs on hold in favor of the event. KUDOS to all. On Saturday, racers got in 5 races in “sporty” wind conditions and one race on a drifty Sunday." LMACC WINNERS: Overall Winner: Rob Hallawell, US Sailing Center Martin County; 1st Woman: Dorian Haldeman, Severn Sailing Association; 1st Great Grand Master: Lindsay Hewett, Cold Spring Harbor Boat Club; 1st Grand Master: James Jacob, Severn Sailing Association; 1st Master: Rob Hallawell, US Sailing Center Martin County; 1st Apprentice Master: Scott Williamson, Severn Sailing Association. Charlie Brewer (FBYC) was the top southern Bay boat finishing 5th overall. Find complete Laser Masters results here and more about the regatta here. Event Chairman: Jon Deutsch; Principal Race Officer: Rick Klein; Chef: Alain Vincey. This just in: find the results for the 2018 Constellation Cup here. Find the story in the November issue of SpinSheet. Don't see your news here? If you would like to see your Chesapeake regatta in our weekly racing roundup, send photos and results on any given Monday by 9 a.m. to [email protected] and we're happy to include it!